Standard rotary seals are commonly used as sealing element in normal applications, such as industrial motor, automotive starter motor and gear box. An oil seal contains a flexible lip that rubs against a shaft or housing to prevent the leakage of fluids. Some oil seals include a spring to help keep the lip in contact with the shaft. Oil seals are constructed with a metal ring which prevents excessive rubber compression and limits the deformation of the elastomeric element. Type 01 seal is rubber covered O.D. design which is preferable for soft alloy, cast iron/steel or plastic housing. This type of seal has options of containing garter spring with double lips allowing users to have effective sealing solution under various environments in order to meet the customers’ requirement. Those designs are commonly used in industrial and automotive application. Type 02 seal with outer metal case design is adequate for steel/cast iron housing and increase accurate fitting into the housing. It provides users with precision sealing effects. This type of seal gives users with options of adding garter spring and double lips. Those designs are commonly used in industrial and automotive application. Additional inner case with reinforced plate design provides greater structural rigidity and stability for installation. The reinforced plate design is suitable and ideal for compensating the housing when its surface is slightly damaged. This type of seal gives users with options of adding garter spring and double lips. Those designs are commonly used in industrial and automotive application. Similar to type 01, only its internal metal case surface is fully covered by VITON rubber to prevent and protect metal cast from the corrosion of medium such as organic solvents and erosive chemicals. The design with fully cover with VITON increase chemical and erosive resistant which enables mechanics to operate with efficiency and maintain its’ sealing performance when exposing under chemical and erosive substances. VITON fully cover seal with options of adding garter springs and double lips design is available in WinTek. It is widely used in industrial application. 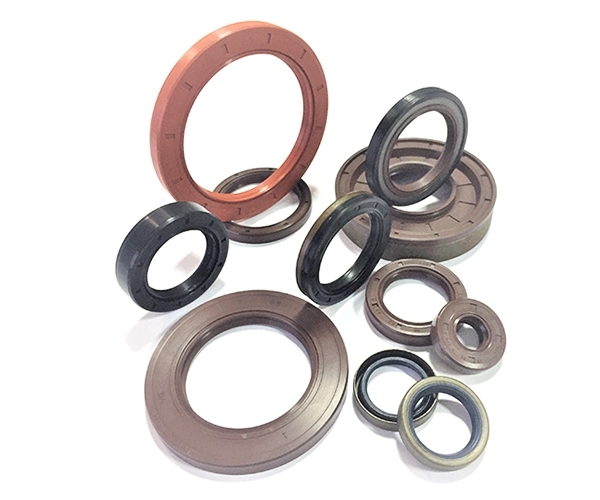 Type 05 seal with corrugated O.D design is suitable for housing with greater thermal expansion coefficient. It increases the effectiveness of the sealing solution and protection of the operating mechanics. Corrugated O.D design with double lips and garter spring is also available in WinTek at your service. Corrugated O.D seal is commonly used in industrial and automotive application. Outer metal case with grounded surface, front chamfer, rubber lining enhance the ability of resistant of internal face from corrosion environment and adding protection to the metal case. Type 07 seal with grounded metal case surface and rubber covered to the edge improves its’ sealing ability and enhancement sealing performance.